Considering that I already have several metres of books precariously stacked around my walls in front of my bulging wall to wall bookcases, commonsense would indicate that I shouldn't buy another book until I find space for all the others. But yesterday I did buy another book, a big one. 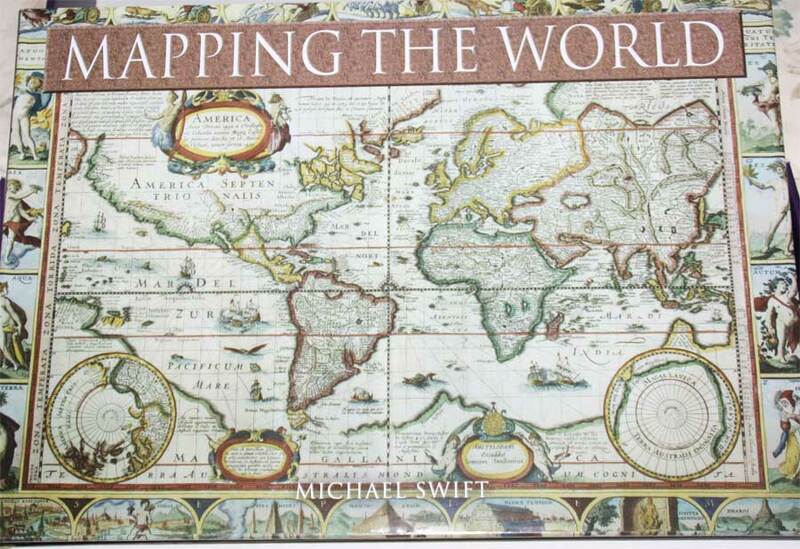 This one is called "Mapping the World" by Michael Swift, New Jersey : Chartwell, 2006. 256 p. : ill. (some col.), maps (some col.) ; 31 x 43 cm. (12.5 x 17.5 in.) Landscape in format, this is a coffee table book full of glorious colour plates of maps from the earliest times (cartographically speaking) - from 1200-1085 B.C. 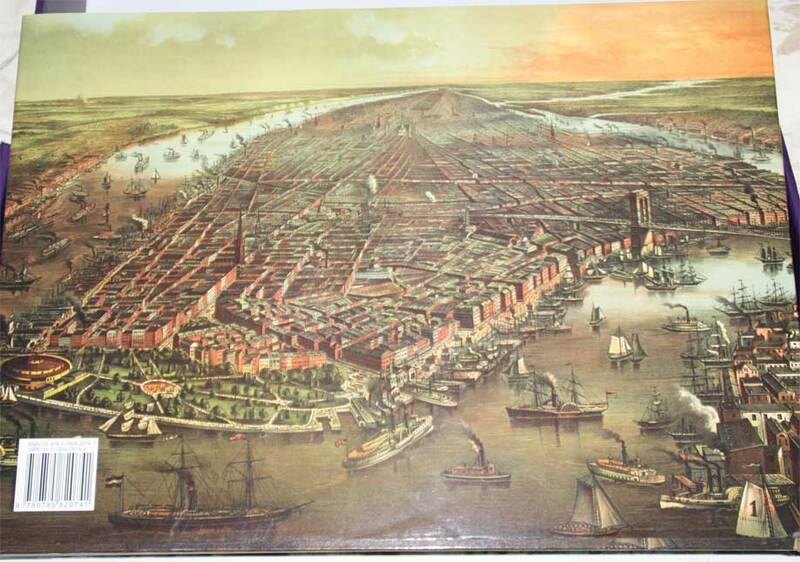 to the end of the 19th century. 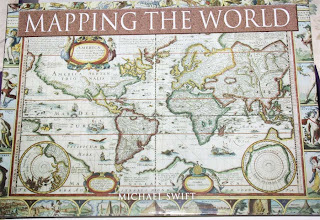 Michael Swift is the pen name of a London publisher who writes about cartography and while this is more coffee table style with brief captions rather than a learned look at maps, it is certainly a feast for the eyes. Michael Swift does give an introduction to the subject but, disappointingly doesn't provide an index. This is a serious omission (my cataloguing prejudices showing) but I'm in a forgiving mood, and I did find the book on the remaindered shelf, after all. As some of the maps depict 16th century marine animals - my favourite subject - I couldn't resist. The photos show the front and back covers. As with so many books cheaply published (and sadly many that cost the earth), this book is badly constructed. Machine sewn, the sections appear to be glued together, with a narrow strip of mull holding the book, which is large and heavy, and without careful use the text block will fall out of the covers. ahhhh I'm just a sucker for ALL books obviously! Yummy! And why do I have a sneaking little feeling that Carol, irked by the thought of the lovely book falling apart, will re-bind it? It is a beautiful book, but considering your comments, I'm glad that you got it for a good price. And I'll bet you are in your glory looking at the marine life! 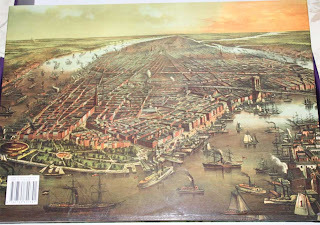 Books, maps, marine animals - no wonder you couldn't resist, no matter the binding! Also, I'm beginning to realize that bookbinders never hesitate to re-bind where necessary. Go on! You know you want to! It looks like a very nice book...and atleast you have the skills to rebind it if it does fall apart! I also have this awkward and beautiful book, and the bulging bookshelves, and the piles of books looking for a safe home. Badly bound and with its other short comings it still sounds good, perhaps I should look for it too! It's a shame when a publisher doesn't respect their own book enough to bind it well. It's all about cost-cutting I suppose. Any pictures of the rare and elusive Hurlothrumbo Frank Urbiis?